Concrete Overlay. 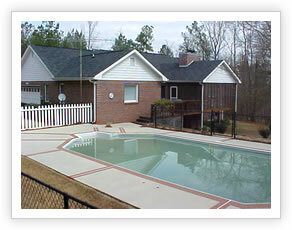 a color integrated, modified acrylic cement product is applied to the existing concrete. It can be applied by troweling the material onto the concrete and finishing it with a stone or slate texture or smooth finish and then any color can be washed into it to achieve the look that is desired. The acrylic cement can also be sprayed on and given different textures that are very slip resistant and can also be done with any color. Any of these finishes can be applied over a stencil or pattern to replicate flagstone, brick patterns, tiles of any size, or a design of your own. The job is then sealed for easy cleanup and protection. An overlay is much cooler on bare feet than any thing else such as stone, pavers, concrete, or bricks which makes it great for outdoor areas such as pool decks, patios, and walkways. With limitless colors and texture, this system can add to the appeal of any home or office. Acid Etch Staining transforms an ordinary concrete slab into a luxurious floor that resembles marble or glazed stone. Each concrete slab accepts the stain in varying degrees of intensity creating stunning, multi-hued color variations and an uneven surface that looks perfectly aged. It will not chip, fade, or peel, and will last the lifetime of the surface to which it is applied. 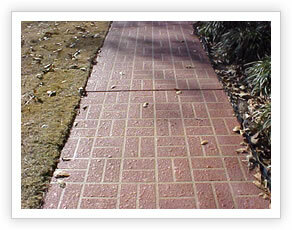 This application can be scored or engraved in any design or pattern and then sealed for easy maintenance and protection. Epoxy Flooring can be installed as a colored or clear coating. Color chips can also be applied to create a terrazzo appearance. Used in garages, shops, commercial and industrial applications.Can also be used to create colorfully designed floors. Stains and Sealers can be applied in a color or clear over bare concrete or overlays for protection and stain resistance.